The resort has a two storey hotel building which accommodates about 75 comfortable, clean and well equipped rooms. There are 4 room types available; Standard, Superior, Deluxe and Thai house Villa Air-Con - all with hot water and mini-bar. The Superior Air-Con rooms are more spacious with a separate living room. The resort also has a nice restaurant on the beach, which turns into the lively club/bar during the night of the Full Moon Party. Full Moon Period: 3 days before and after Full Moon date. All room prices are INCLUSIVE of breakfast. for 2 persons, except Deluxe Family breakfast for 4 persons. Thai House Villa for 3 persons. 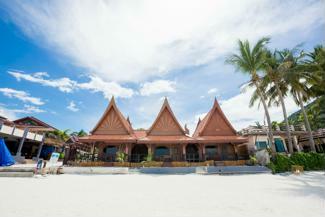 1,500 Baht per night for Peak Season. No extra charge for child under 12 years old sharing the same room with parents (maximum 1 child per room) without extra bed. Compulsory child breakfast is 100 THB per child. Full Moon Party Periods is non refundable in any case. Full Moon Mar-Jun 2019: A minimum stay 3 nights. Full Moon compulsory surcharge 750 Thai Bath per person. NO CHARGE FOR MAR-JUN 2019 FULLMOON.